Belorussian Strategic Offensive Operation (operation “Bagration”) resulted in complete destruction of German Army Group Center. In 2 months the 1,100 km front-line moved 600 km west. During this operation, the Soviet armies in Belarus completely destroyed Army Group Center of the Wehrmacht, losing five times fewer people than the Germans. 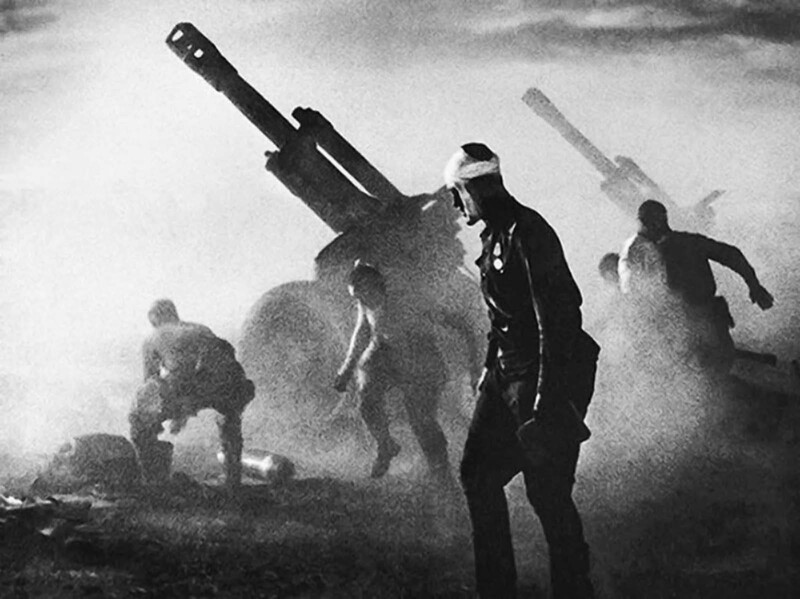 This photo was taken on the summer of 1944 by Emmanuel Yevzerikhin. In the Soviet photographic album this photo is called “Stand to Death”. The soldiers and the guns look so futuristic. The gun is a D-1 howitzer, model 1943. In 1941, for various reasons it was discontinued mass production of 152-mm howitzer model 1938 (M-10). In 1942, trying to solve the problem of lack of a suitable mobile 152 mm howitzer, the design bureau headed by F. F. Petrov started to work privately on a new howitzer, based on the carriage of the M-30 and the barrel of the M-10 (which was fitted with a muzzle brake in order to reduce the recoil and thus prevent damage to the lighter carriage). The approach allowed production to begin on the new howitzer almost immediately from the stockpile of parts for both earlier guns. Given the war situation and shortages of artillery, this solution was both elegant and expedient. The State Committee of Defense requested five of the new guns to be sent to the testing grounds on 1 May. On 5 May, two pieces were received for trials; two days later, on 7 May the gun was recommended for adoption, and on 8 August 1943 it was officially adopted as the 152 mm howitzer M1943. One and a half months later, the first series production D-1 howitzers were delivered to the Red Army representatives. The Red Army employed D-1 howitzers from 1944 onwards, during the final stages of World War II. The D-1 was used primarily used against personnel, fortifications and key structures in the enemy rear. The anti-concrete G-530 shell was also sometimes used against armored vehicles with good results. During its service the gun earned a reputation for being reliable and accurate. The D-1 was finally withdrawn from service in the mid-seventies. A very moody and atmospheric photo - it looks like the soldier in the foreground has had a head wound which has been bandaged. Do not forget that, in order to destroy Hitler, the West chose to ally themselves with Stalin. Russian joke: "When analysts look back on history, Hitler will be regarded as only a minor tyrant of the 20th century..."